Celebrate #NationalLamingtonDay and stuff your face. Bennelong's lamington redefines this iconic Aussie dessert. We're all pretty proud of our Aussie desserts -- Anzac bikkies, pavlova (let us have this, New Zealand), chocolate crackles, fairy bread and, of course, lamingtons. Now over 100 years old and an Australian culinary icon, we all have fond memories of eating lamingtons, whether they were freshly made by nan or from those flimsy plastic packets and shared amongst your mates. Today is National Lamington Day, the day we can inhale 10 of these fluffy, sweet morsels and still have room for a few more. To celebrate these delicious squares of sponge cake coated in chocolate and rolled in desiccated coconut, we asked Bennelong Restaurant in Sydney to share their jaw-dropping twist on lamington cake. This reimagined Australian classic is made up of a square of cherry jam coconut cream ice cream and sponge coated in a glossy chocolate ganache, and surrounded by a halo of liquid nitrogen coconut milk parfait 'dessicated coconut'. Drooling yet? Check it out below. If you're a Masterchef fan, you will recognise this dessert from the lamington Pressure Test with Bennelong's Peter Gilmore. But don't let that deter you from making this lamington cake. Preheat the oven and pop on your apron -- it's lamington time. 1. Preheat oven to 160°C. Turn on ice cream machine to chill. 2. For the lamington sponge, lightly spray a ¼ sized gastronorm tray with canola oil spray, then line with baking paper. 3. Place eggs and sugar into a stand up mixer fitted with a whisk attachment, and whisk until light and fluffy. Fold in sifted flour then pour out mixture into the lined gastronorm tray. 4. Place the tin into the oven and bake until lightly golden, about 20 minutes. Once lightly golden, remove from oven and set aside on bench, still in the gastronorm tray and rest for 20 minutes. 5. Once rested, turn out sponge cake onto a cooling rack and set aside on bench to cool completely until required. 6. For the cherry ice cream, strain juice through a fine sieve and measure out 150g of the strained juice into a medium sized saucepan. Bring to the boil. Measure out remaining 200g of the strained juice into a separate bowl and set aside until required. 7. Meanwhile, place egg yolks and sugar into a medium sized bowl and whisk together until pale and creamy. Whisk boiling strained juice into the egg and sugar mixture, and place over a pot of boiling water. Whisk until mixture reaches 80-85°C, then place straight over and ice bath and whisk until mixture cools to at least 8°C. 8. Once temperature has come down to 8°C, whisk in cream and remaining 200ml of strained cherry juice. Pass through a fine chinois (mesh strainer) and transfer to the ice cream machine. Churn until set. 9. Once set, transfer ice cream mixture to a ⅙ gastronorm tray and cover with a square of go-between. Place in freezer until required. 10. For the cherry jam, strain cherries and remove stones. Set the pitted cherries aside in a bowl and discard liquid. Place cherry jam into a small saucepan over low heat and gently bring it to the boil. Once boiling, add pitted wild cherries and simmer, gently stirring for one minute. 11. Remove from heat and set aside to cool. Once cooled, transfer to clean bowl and set aside in the fridge until required. 12. For the coconut cream base, place milk, cream and sugar into a saucepan over a medium heat and bring to the boil, stirring gently. 13. Place coconut milk powder into a bowl. Once milk and cream mixture is boiling, pour onto coconut powder and whisk well until smooth. Pass mixture through a chinois (mesh strainer) into a clear bowl and set over an ice bath to cool down to 3°C. 14. Measure out 500g of coconut cream base into a clean bowl for the whipped coconut cream and set aside in the fridge until required. 15. Measure out 550g of coconut cream base into a separate bowl for the Frozen Shavings and set aside in the fridge until required. 16. For the frozen shavings, line a ½ sized gastronome tray with baking paper. 17. Add double cream to the coconut cream base and place into a stand mixer fitted with a whisk attachment and whisk until soft peaks form. Pour 820g of the mixture into prepared gastronome tray and level off with an offset metal palet knife. Place into the blast freezer until firm. 18. Once firm, turn out frozen coconut block from tray and cut into four even sized blocks. Wrap blocks individually in baking paper and set aside in freezer until required. 19. For the whipped coconut cream, add double cream to reserved coconut cream base and place into a stand mixer fitted with a whisk attachment and whisk until just stiff peak stage. Transfer to a small bowl and set aside in fridge until required. 20. For the cherry jam, strain preserved wild cherries and remove all pits. Set pitted cherries aside in bowl and discard juice. Bring the cherry jam gently to the boil. Add pitted wild cherries to the jam and simmer for one minute. Take off the heat and chill. Set aside until required. 21. For the chocolate glaze, start by placing gelatine in a bowl of iced water to soften. 22. Half fill a small saucepan with water and bring to the boil. 23. Once boiling, reduce heat to simmer. Place chocolate into a medium heatproof bowl and place over the saucepan of simmering water until melted completely. Keep warm until required. 24. Meanwhile, bring sugar, cream, water, and cocoa powder to the boil. Whisk well and simmer for one minute. Strain liquid, add melted chocolate and gelatine. Once incorporated, strain again and keep at room temperature. 25. For the soft ganache, combine chopped Amedei and Manjari chocolate in a medium sized bowl. 26. Bring cream to the boil, then immediately pour over the chocolate. Stir until smooth and set aside until the ganache reaches 36°C. 27. Once the the chocolate mixture has reached temperature, add butter a little at a time, blending well after each addition with a stick blender. Continue adding butter until ganache is fully emulsified and shiny, being careful not to incorporate too much air after each addition. Transfer into a piping bag and set aside on a cool bench until required. 1. To finish the frozen shavings, first sit a mandolin flat across an insulated steel bowl of liquid nitrogen. Take a frozen coconut block out of the freezer and shave the longest side using even pressure. Ensure the shavings are thin and submerged in the liquid nitrogen. 2. To produce the lamington mixture, trim crusts off the lamington sponge. Tear the fluffy inside into small morsels. Pick eight pieces and place in a small bowl. Take one heaped tablespoon of cherry jam and dot over the morsels of sponge cake in the bowl ensuring the jam is evenly distributed. Pipe eight small mounds of soft ganache, roughly the same quantity as jam, and distribute evenly inside the bowl. Add 2½ heaped tablespoons of the whipped coconut cream to the bowl and gently fold ingredients together to roughly combine all ingredients. The mix should be a single mass, but each ingredient should still be clearly identifiable in the mixture. Do not over mix. 3. Place square mould into serving bowl, and fill half way with lamington mixture. 4. Using a 35ml ice cream scoop, scoop a ball of cherry ice cream out and drop into liquid nitrogen for 20 seconds. Remove from nitrogen and put the ball of cherry ice cream into the square mould. Fill the square mould with remaining lamington mixture, completely encasing ice cream. Level off the surface with an offset palette knife until very smooth. 5. Blowtorch the four sides of the mould just enough to loosen and lift mould away from the bowl. 6. Check that the glaze is 21°C. Cover the surface of lamington mix with just enough glaze to evenly coat and cover the top surface and edges. 7. 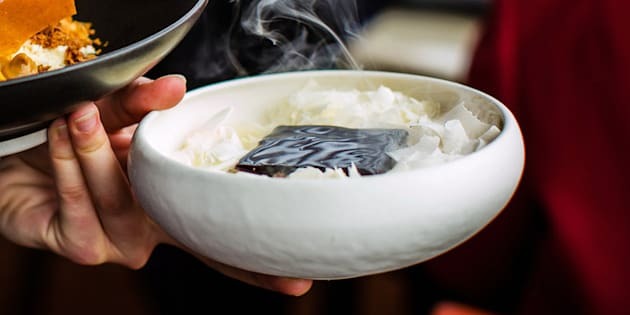 Using a slotted spoon, carefully scoop the frozen coconut shavings from the bowl of liquid nitrogen and arrange evenly around the lamington square. Move with caution to assure none of the shavings touch or spill over onto chocolate glaze. Serve immediately. Here's some more lamington inspiration.